Mother’s day is celebrated throughout the world on different days of the year, furthermore, we all agree in the celebration and appreciation to these angels that brought us into this world and raised us (not always both). However, more times than few these women came to us as grandmothers, aunts and sisters, and to others chosen later in our childhood but always with the love of a mother. 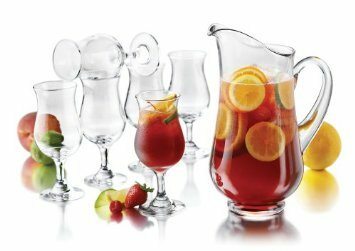 Libbey 7 Piece Sangria Set The following Sangria recipes are for two pitcher servings. The reason I did this is because I think you should definitely enjoy one pitcher at brunch with Mom and a second pitcher at sunset! Pour rosé wine and liquors into two pitchers. Toss in the fruit slices (leaving out seeds if possible). Add all juices and stir. Let the batch chill overnight to blend and work its magic. Add strawberries and lychee fruit (optional) 2 to 3 hours before serving. Add sparkling wine into pitchers just before serving. Fill tall glass with ice pour sangria over it. Garnish with orange slices and serve. 1. 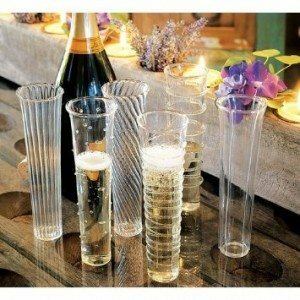 If you need to add bubbles to your fizz. You can always top the glass with lemon-lime soda or ginger ale. 2. You can find guava nectar and lychee fruit in ethnic food section of grocery store. Pour all juices (nonalcoholic wine if you choose to use it) into a pitcher. Squeeze juice from lemons and limes wedges into pitcher without seeds. Toss in the citrus fruit slices (leaving out seeds if possible) and strawberries then stir. Let the batch chill for a few hours. Fill tall glass with ice and pour the sangria over it. Garnish with mint leaf and serve. Also, a great idea is to create a Champagne bar with mixers and syrups. Fill a chilled Champagne flute ⅓ full with chilled orange juice and guava nectar. Top off the flute with the sparkling wine. Stir the mixture with a bar spoon. Garnish with an orange twist. Fill a chilled Champagne flute ⅓ full with chilled white cranberry juice. Top off the flute with the sparkling wine. Stir the mixture with a bar spoon. Garnish with a lemon twist. Fill a chilled Champagne flute ⅓ full with chilled lychee juice. Top off the flute with the sparkling wine. Stir the mixture with a bar spoon. Garnish with a whole lychee fruit cut in half. Fill a chilled Champagne flute about ⅓ full with chilled pomegranate juice. Top off the flute with the sparkling wine. Then, float the Grand Marnier. Stir the mixture with a bar spoon. Garnish with an orange twist. Fill a chilled Champagne flute about ⅓ full with chilled peach nectar. Top off the flute with the sparkling wine. Stir the mixture with a bar spoon. Then, float the Grand Marnier. Garnish with an orange twist. Top off the flute with the sparkling wine. Then, float the Campari. Garnish with an orange twist. WARNING: Campari is a dry bitter Italian Liquor. I love it!!! Previous posts have had syrups that would be a great addition to the champagne bar, for instance, lavender and hibiscus syrups. However, I would only add ½ to 1 ounce of syrup per drink. Have a Happy Mother’s Day and call her for God’s sake!!! Lovin the lychee juice option!!! Love sangria! Thanks for the the non-alcoholic recipe, too! I’m glad you enjoyed the non-alcoholic sangria.